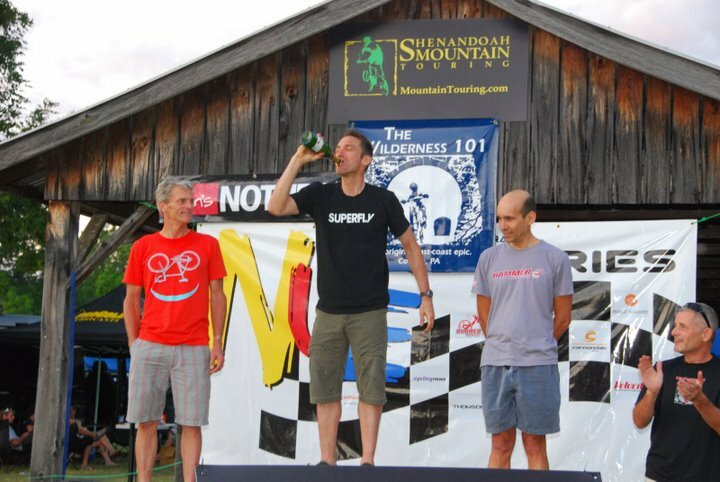 There are two races in the National Ultra Endurance Series with east-coast style rock riding: the NUE final race, the SM100 in September, and the race held this past weekend near State College PA, the Wilderness 101. Dubbed the original east coast epic, with over 10,000 feet of climbing, the going up part of the 101 is mostly a gravel road climbing race. However, as we’ve learned from Isaac Newton, what goes up must come down. 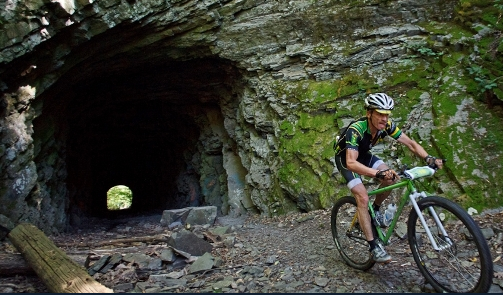 The descending on rocky technical east-coast style trail is what make this race special. Yes, east coast epic. I’m racing Masters this year. In the NUE, that means I race against other 50+ guys. As we line up, I’m looking around for who might be my competition. The west-coast super star and likely leader of the NUE next week, Doug Andrews was an extremely unlikely show. Last year’s NUE Masters champion and my 29er Crew teammate Robert Herriman was also a no-show because of crew member (Tim Finkel’s) wedding. Congratulations Tim! From the pre-race hype, I know that Independent Fabrications rider Mike Ramponi, who finished 3rd at the SM100 last year on single speed, is here and I suspect racing in the Masters category. Mike doesn’t even own a geared bike, so maybe this is my race to win? My thoughts are quickly re-calibrated when I look to my left and see reigning US Masters 55+ National cyclocross champion Kevin Hines on the line. What? Who else is here? Steve Tilford? Maybe Ned Overand? Oh well, I can’t worry about that now. Bang, we’re off! Actually, that’s not accurate. There is no bang, no starting official or starting ceremony at the 101. This is grass roots racing at it’s east coast best. At 7am, the entire 350 person field simply starts following the lead pace vehicle down the gravel road out of Park and out on the pavement away from Coburn towards the first climb. So it begins. Once on the climb, things start to string out. I quickly realize, I’m not feeling so hot… not horrible, but not 100% either. This, most likely from the hard effort last weekend at the Curse of Dark Hollow. Because of my relative success last week on the Superfly 100, I’m back riding the identical setup. With my pseudo uncooperative legs, I was now wishing for the light weight of my Superfly Elite Hardtail. Oh well, I can’t worry about that now either. It takes awhile, but I finally find my legs just a little bit. On the rolling climbs up to Aid 1, I catch the group with Mike Ramponi. He’s on rigid single speed running 32×18 a pretty big gear considering all the climbing that’s in store. I chat with him a bit and can tell he is putting out some effort cause we are MOVING. As we ride on the pavement briefly through the tunnel under Rt 322, he stays with a big group of relatively fresh geared riders without any trouble. He’s come to race. As we pass through Aid 2, I toss my half empty bottle and grab a bottle hand off. It’s going to be hot today and the hand-off didn’t take any time so why not? Between Aid2 and Aid3 is mostly comprised of primitive double track climbs and descents averaging maybe 5% grade. The pace is still high. I’m joined by fellow crew member Daniel Atkins. He’s riding his Superfly Elite Hardtail and climbing strong. We chat a bit. On the first of the descents, riding with Daniel, I’m able to get some separation on Mike mainly by pedaling in a big gear. On the next uphill however, the IF rider takes advantage of the relatively shallow grade and dances past Daniel and I on his 20 pound bike. He’s throwin’ down. At mile 25 we turn left into the single track combo of Longberger Path, Spruce Gap Trail and 3 Bridges Trail, the first real single track of the race, I quickly close in on and begin to pick off riders from a large group that’s led by Freeze Thaw Cycles rider Vicki Barclay and Team CF rider Cheryl Recchia Sornson. With some effort, on the climb up Laurel Run Rd, I close the gap on Vicki and Cheryl. They are both riding strong. Cheryl’s glued to Vicki’s wheel. I’m just about on the rivet. As we go around the big left hand switchback, the pitch gets steeper and it becomes clear that Vicki is in charge here. Cheryl starts to loose contact. Despite my words of encouragement, she’s gapped and Vicki’s riding off into first place. Sensing blood, Vicki seems to step it up just a bit, enough so I’m doing everything I can to hang on. Impressive. At mile 30, we turn left into Little Shingletown Road Trail and begin a gradual primitive double track descent. I’m on the wheel of Freeze Thaw Cycles rider Rich Straub who’s really a fast descender. By the bottom, we’d passed several riders from the Vicki group including Vicki. At the bottom, it turns out working to get the lead on the fast descent doesn’t really pay since with 5 flat pavement miles to go to Aid2, we collectively sit up and regroup in order to work together on the road. It pays off. Aid Station 2 was really busy when we arrive. The Aid2 volunteers were ON IT. I and the others in our group had our bottles in no time flat and were off. Thank you people! After Aid2 we go left on Greentree, a long fire road climb that takes us up roughly 1400 feet in elevation gain. Less than half way up, the Vicki group is thinning. Rich is gone right away and soon after I realize, I’ve also got to let her go. I just don’t have the goods to climb with the cute red-haired PhD from Scotland. She’s riding great! At the top, we make a right on Croyle Trail, the first of several really rocky technical descents. At this point, the Superfly 100 is loving the change in difficulty. I’m flying down the trail in search of an IF rider on a rigid single speed. Despite having over 4 inches of travel on each end and 29 inch wheels, my teeth are chattering but I’m on a mission. One disadvantage of riding rigid is your tires and your body are your only suspension. As aggressive as Mike Ramponi is on descents, he surely pushes the limits of his rubber. Sure enough, less than half way down, I see my fast Indy Fab friend changing a flat. With two thirds of the race remaining, I feel certain this is only a temporary setback for the fast Ramponi from Massachusetts, so I press on. Not one minute later, my chain derails and I can’t seem to get it back on by pedaling. Doh! I’m forced to stop, realizing that the chain is actually in a knot that will have to be undone by hand. I pull over just past my friend and Team CF rider Christopher Beck. He’s fixing a flat too. He runs over to me holding out an inflator of some sort asking me if I know how to use it. I look at it briefly. It’s not familiar and I’m not really in a position to take time to try and figure it out. I tell him no and he sends me on my way. Sorry my friend. I was really just too stupid at that point to help! By the bottom of Croyle at mile 52, the technical prowess of the Superfly 100 has allowed me to put some time into Daniel and certainly IF Ramponi. By half way up the climb towards Aid3, Daniel is back and seems to have really found his legs. Climbing strong, he rides by me. I catch Daniel when he stops to get bottles at Aid3 but he drops me again on the new single track climb called Pigpile. I finally catch him when we start the drop off the mountain on Sassafras Trail. Always the gentleman, my young teammate lets me by, sensing my groove with a fun descent on a full suspension 29er. In this single track between Aid3 and Aid4, I’m at my finest. The Superfly 100 is on cruise control with me along for the ride bearing a very large grin. At the bottom of Sassafras, I nearly regain contact with the Vicki group which is now just Vicki and another rider. Daniel eventually passes me again on the short climb up to Beautiful and No Name Trail. It’s GO time for Mr. Atkins. I get bottles at Aid4 and begin the long soul crushing climb that starts with Stillhouse Hollow and finishes with Sand Mountain. I start out feeling ok with Daniel still in sight, but realize as I near the top by mile 80 that my matchbook is just about empty. When the grade finally points downhill again, as if to add insult to injury, the new course takes us left on a super rocky double track descent called Panther Run Road. This is no road. It’s a rock strewn minefield. It’s really hard to go fast here despite the slight downhill trajectory. My form is on thin ice. I stop at Aid5 even though I have enough fluids to finish. I need something. Three dixie cups of Coke later, I’m a new man and back on my bike toward the finish. Just before the last climb up Old Mingle, my rock star friend Chris Beck passes me with a guy I was riding with earlier. He yells at me to finish strong. They are not going that fast, but there’s no way I can ride with them. The last 5 miles took an eternity. I’m so spent by Fisherman’s path, I can only ride a small fraction of it. I keep looking over my shoulder for Ramponi. I’m suffering and I know he’s going to pass me at any minute. Where’s the finishing line? Finally, I cross the line at 7:58, good enough for the Masters win and my first NUE win ever after 15 tries! Nine minutes later, the 55+ superstar Kevin Hines finishes. It turns out he was riding in the Open and not the Masters even though he’s old enough. I hadn’t seen him all day. Mike Ramponi finished at 8:21 and had apparently suffered two flats. Bad luck my friend, you were certainly the stronger man in the beginning. Hammer Nutrition rider Mark Virello rounded out the Masters top-3 at 8:39. In the Open, my friend and fellow Trek team rider Jeff Schalk somehow managed to get a several minute late gap on super strong Team CF rider Christian Tanguy for the win at 6:26. That is incomprehensibly fast. Well done sir. RBS Trek MTB Team rider Mike Simonson had a great ride at 6:49 to finish 3rd. Superstar cyclocrosser, Roger Aspholm finished 4th at 7:05. My crew teammate Daniel Atkins finished strong at 7:46. Vickistar crushed the woman’s field with a 7:42 finish time. Are you kidding me? There’s a tremor in the NUE woman’s universe! Way to go. Motor Mile Racing’s Brenda Simrill was 2nd at 8:17 and MTBRacenews.com‘s Karen Potter finished 3rd at 8:41. Nice work ladies! In the single speed, Salsa Cycles rider The Pflug continued his winning ways with an incredible time of 7:19, good enough for 8th overall! That’s a fantastic ride Gerry. The ever present local Freeze Thaw Cycles Matt Ferrari finished 2nd at 7:40. Matt is probably the best single speed rider never to win an NUE. Keep trying my friend. It will happen. Next was Jordan Wakeley who came back from a bad crash early to take 3rd. A huge thanks to the tiny Appalachian town of Coburn PA for letting hundreds of mountain bikers call your little park home for a weekend. Thank you all the race volunteers who worked in the hot sun all day to keep us on our way… especially that guy at mile 90 who kept me from steering off course after I somehow missed the left turn to start the Old Mingle climb. Thank you sponsors of the Wilderness 101. Finally, huge thank you to Chris Scott and the rest of the Shenandoah Mountain Touring crew who in concert with Jessica and Peter Buckland and the Freeze Thaw gang, once again put on a great edition of this race. You all rock! 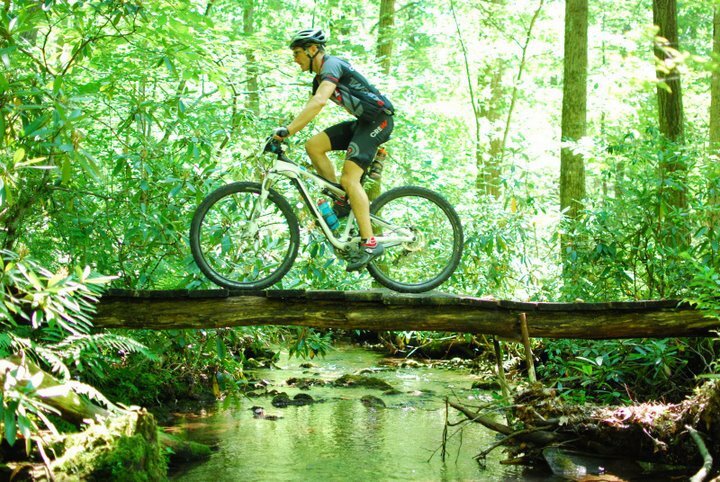 The 101 is a celebration of back country mountain bike racing in the Bald Eagle and Rothrock State Forests of Pennsylvania. What makes this race so awesome is festival atmosphere that’s alive and well at Coburn Park all weekend. This is a must do race. This entry was posted on August 2, 2011 at 3:32 pm and is filed under Must do Races. You can follow any responses to this entry through the RSS 2.0 feed. You can leave a response, or trackback from your own site. Roger….amazing win! Congratulations. You are an inspiration.